Just in time for Pi-day, a little classroom math-a-magic that works for any day of the year. Above you recognize the initial three of pi followed by the first fifty decimal digits. Point out that the 50th digit of pi is a nice round circle, a nice piece of math trivia. Near the end I've described a way to emphasize the zero in the "trick." Start by picking any digit in the first row, even the three if you wish. Now count out the spelling of that number beginning with the following card; (spell "zero" or "naught" as you like) if you picked the four, count "F-O-U-R" as you touch the 1, 5, 9, and land on the 2. Now do the same thing with the two, T-W-O should put you on the 3 between the two fives. Continue until you land on a number in the bottom row. Now concentrate, what number did you land on..... I'm guessing 5. Many variations of this clever trick have appeared in the four decades since Princeton physicist Martin Kruskal discovered the idea (1975-ish? ), and Martin Gardner popularized it in his Scientific American column and a book; (Gardner Penrose Tiles to Trapdoor Ciphers Freeman and company 1989 . The "trick" is based on the mathematical idea of Markov Processes (translate that as a Probability concept). So the path of 41 goes to 22 and then to 32 then to 93, to 84 and to 45. I will stop there for a reason that will become obvious in a moment. From 11 (that's the one in the middle of the row) the path is to 22 and since that is in the path of 41 they will hit all the same numbers. 51 goes to 52, the first 93 and then 24, 44, 45. And what if we start at 91, the next step is 32 which is also in the path of four and one in the first row. By the time you get to nine in the fifth row, all the starting places have come together and will follow along, inexorably toward the five in the bottom row. 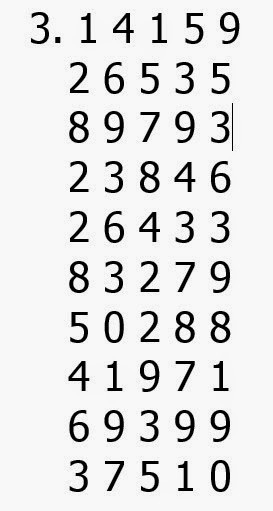 If you want to offer more variety, you can let them pick from any number in the first two rows, since the six and five we didn't use in row two, also join up before we get to row five. (That means you can do the same thing using only the first five rows. Instead of predicting their value, you might reproduce only down to the row with 50288 and tell them to stop when they get a number in the last row. After all, Pi is closely related to circles. If you really want to demo the math behind the idea, to show that it is general rather than something that works on selected fixed objects, pick any book off the bookshelf, open a random page and mark off about fifteen lines of print. For each word count the number of letters and use that to tell you the count to the next word. (lather.... rinse... repeat). Stop when the next count would put you past the boundary. Now try all the words in the first ten and see where you end up each time. Jim Wilder has a nice "domino" version of this at his recreational mathematics page. Jamie Grimes has a video with a card trick version of this here and there is even a version using the Declaration of Independence at the Numericana site which you can see below. Write out the first few lines of the Declaration of Indepenedence, (I've read that John Allen Paulos came up with this one. Enjoy, and next to Pi, I like Chocolate Pie the best.... Have some.